Pokemon GO is certainly no stranger to seasonal events. It also just so happens to have an ever-growing roster of spooky pokemon ready to roll out as soon as it hits October. It’s no surprise then, that Niantic has launched a Pokemon GO Halloween event, shining a spotlight of ghosts, ghouls and Gengars. In this Pokemon GO Halloween event Guide, we’ll go over all of the info you need to know about the Halloween event that is currently live in Pokemon GO. We’ll take a look at the double Candy bonus, as well as some of the new Avatar Items like the Drifloon hat and the Gengar backpack. For more on Pokemon GO, you can check out our Pokemon GO Guides Hub. It’s got a ton of info on a wide range of Pokemon GO topics from Raids to limited time events. As with some of the other Pokemon GO events that have run this year already, the Pokemon GO Halloween Event will see an increased spawn rate for a particular type of pokemon. Ghost and Dark-type pokemon will be spawning more regularly, pokemon like Drifloon, Stunky, and Duskull. One of the coolest things about the current Pokemon GO Halloween Event is the exclusive bonuses that will be up for grabs. Namely the double candy bonus that will be running from now right up until the end of the event on Nov. 1. For every pokemon that you catch in this period, you’ll earn double Candy, so get out there and start catching. Some new Halloween-themed Avatar Items have been added to the in-game store. You can now pick up the Drifloon Hat, the Gengar Backpack, and more. You’ll need PokeCoins in order to purchase these new items, which you get using real-world money. That’s right Pokemon GO fans, you read that correctly. 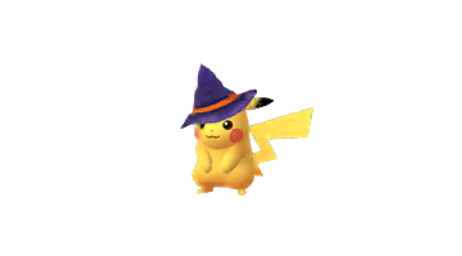 Halloween Pikachu is back, lil witches hat and all. Halloween Pikachu will appear until the end of your event, so be sure to check your nearby Pokemon tab.